Friends, I have a very exciting opportunity for you! Hennepin Theatre Trust has very generously offered to give away a pair of tickets to the new musical Catch Me If You Can to one lucky Cherry and Spoon reader. The musical is based in on the 2002 movie (starring Tom Hanks and Leonardo DiCaprio), and ran for about six months on Broadway in 2011. LIKE the post that says "friends, i have an exciting opportunity for YOU! 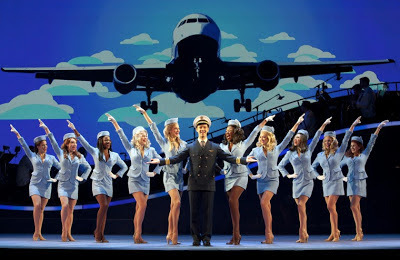 Hennepin Theatre Trust has offered to give away a pair of tickets to the opening night of "CATCH ME IF YOU CAN" to one lucky Cherry and Spoon reader. LIKE this post to enter a drawing to win two tickets to the show on this TUESDAY, dec. 11 at the orpheum theatre in minneapolis. the winner will be announced on SUNDAY evening. good luck!" It's as simple as that! And the even better news is that only 14 people have entered so far, which is much better odds than any lottery you can enter. The winner will be announced on Sunday evening. Good luck! For information on the show or to purchase tickets (if you don't win), which runs for eight performances from December 11 through the 16, see the Hennepin Theatre website.